This article is a summary of research that has been conducted over several years. The initial impetus came from an earlier study (2009) into environmental conditions in enclosed vivaria. Some of the effects noted in that study deserved further investigation, and this study is a development of that earlier work. In addition, evidence emerged during a long-term study (conducted over 15 years) of growth abnormalities in tortoises that the hydration status of scute keratin could be adversely affected by exposure to artificial heat sources in close proximity to the animal, and that the resulting changes in keratin hydration status were at least partly responsible for some of the deformities observed. This article is presented in order to raise awareness of these issues, some of which are quite complex in nature, and none of which are particularly easy to solve in practice. The effects reported occur in almost all installations where incandescent, gas-discharge and dull-emitter type ‘heat lamps’ or ‘basking lamps’ are employed, and will, to varying degrees, affect all animals exposed to them. Individual species will respond in different ways according to their individual physiological and morphological qualities, the structure of the integument (skin) and the size of the animal being of particular importance in determining the outcome. Rather than be viewed as a definitive and complete statement of the effects of artificial heat and light sources when used with reptiles, this document is offered as a basis for further investigation and discussion. It raises what we believe to be some very important issues that need to be considered by all reptile keepers who in any way rely upon artificial heat sources for basking purposes. Historically, basking lamps have only been used with captive reptiles for a comparatively short period of time. Early attempts to keep reptiles often failed because little or no attention was given to their need to thermoregulate or to the quality of lighting they received. It was not until 1944 that Charles M. Bogert and Raymond Cowles published their important text "A Preliminary Study of the Thermal Requirements of Desert Reptiles". This text dramatically changed our understanding of the needs of reptiles both in the wild and in captivity. By the 1950’s, some keepers were experimenting with using artificial lamps to provide “hot spots” and with vivarium systems that attempted to replicate natural temperature gradients. Captive reptile survival times generally increased, but still there were problems as animals continued to die over the longer term from developmental disorders of the skeleton, such as Metabolic Bone Disease. The cause was unknown until 1969, when Joseph Laszlo published “Observations on two new artificial lights for reptile displays” in the International Zoo Yearbook. For the first time, this identified UV-B as a critical factor in reptile husbandry. Since then, many different systems and kinds of heat and light have been used with reptiles in captivity. Surprisingly little research has been done, however, on some remaining problems with artificial lamps. It is often assumed that provided adequate temperatures and UV-B is provided, this is sufficient. New research suggests that although the benefits of artificial heat and light are considerable, current lighting and heating systems are causing entirely new problems of their own. 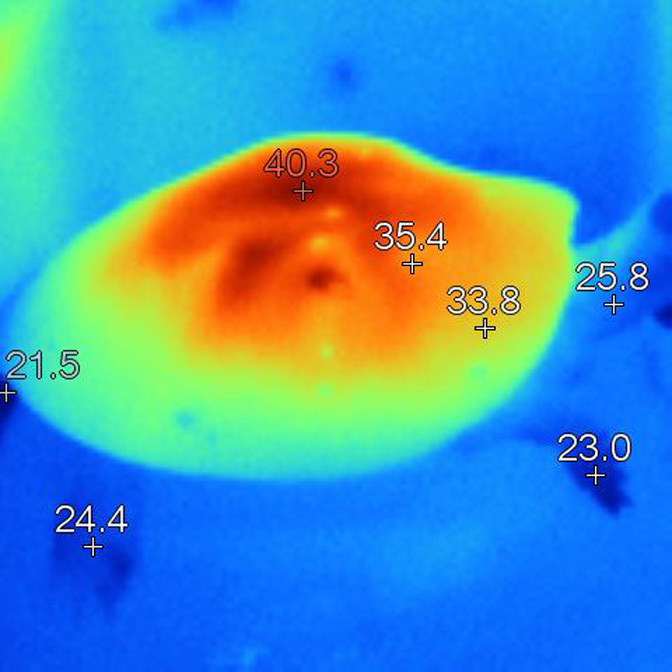 Using infra-red thermal imaging and temperature and humidity data-logging technology, reptile basking lamps are here directly compared to what animals experience in their natural environment. Some disturbing effects are noted and some improvements to current technology are suggested. Some of the earliest references in pet keeping manuals to using a “light bulb” to provide extra light and heat for tortoises date from the 1950’s. Even then, this was not a commonplace practice, with most keepers simply relying upon ambient conditions in the garden. This was not without its drawbacks, however, especially in colder climates, and is is no surprise that many tortoises failed to survive for very long. In response to this, keepers gradually began using lamps on cold days, or early in the spring and towards the end of the season, to provide a much needed boost in temperatures. Many early attempts at captive breeding also failed because of the lack of knowledge of thermoregulation and in particular UV-B requirements. By the 1970’s and early 1980’s, the use of artificial heat and light sources was much more prevalent, especially among dedicated “enthusiasts” and members of herpetological clubs and societies. A dramatic improvement was noted in captive breeding successes and overall survival rates. There is no doubt, therefore, that the use of even fairly primitive artificial light and heat sources made a very useful contribution to health and welfare, at least in terms of reducing illness and losses due to lack of warmth. In due course, manufacturers began to develop and offer specialised lamps and heat sources aimed specifically at the reptile-keeping public. These varied (and still do) substantially in suitability and quality. The best of them, however, do offer significant advantages over ‘ordinary household’ lamps, and such lamps may provide very good approximations of natural UV-B and visible spectrum illumination. Indeed, most of the attention on artificial lighting and heating systems has been directed towards improving UV-B and visible spectrum performance. The importance of infrared (IR) has tended to be rather overlooked and understudied, except insofar as provision of a simple ‘basking spot’. This widespread adoption of artificial light and heat has not been without problems. Some injuries and conditions that were practically unknown before began to emerge quite rapidly as take-up of such methods increased. Today we have a situation where many keepers rely almost exclusively upon indoor accommodation and upon artificial heat and light sources, so the incidence of these problems is now very high. Tortoises and the larger lizards are really very challenging animals to heat artificially. In nature, they have developed a wide range of behavioural strategies for both acquiring, and losing, heat as required. These include the use of burrows and scrapes, various body postures, and a very finely tuned sense of when to seek full sun, or when to make use of partial or full shade. In addition to direct radiant heat from the sun, they also make use of reflected and indirect (by contact) heat from the environment, and convection. In their natural environment, this works very well indeed. Out of the natural environment and faced with totally unnatural sources of light and heat they can easily be “confused”, and misinterpret the situation. The precise spectrum of emissions from artificial sources, though close to solar radiation in some areas, is very different in others, and this too has important implications. The skin of desert species may reflect up to 35% of solar radiation, compared to about 6% in the case of tropical forest species. The limb scale type also influences abilities to survive in specific environments. 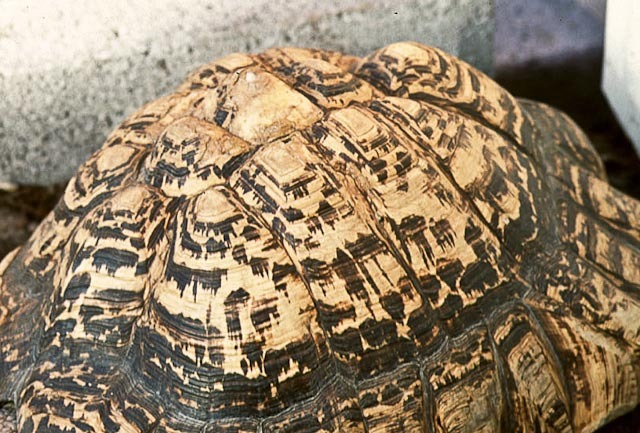 Rough, coarse scales (as seen in Geochelone sulcata, for example) form air spaces which have an insulating effect – the smoother scales of a turtle, such as the North American box turtle (Terrapene carolina), have no such effect. All species may suffer from dehydration as a consequence of an incorrect environment, but tropical or humid habitat species are particularly vulnerable due to structural differences in the integument which lose fluid far more readily than that of desert reptiles. Animals that absorb solar radiation well also lose it quickly, via back-radiation when external heating ceases (i.e., when the sun goes down or an artificial lamp is switched off). A habitat that heats up rapidly in the daytime, such as a desert, also cools very quickly at night. The same applies to tortoises and turtles. Exchange of heat within an environment occurs through the body surface, and hence, the greater the surface area of the body the greater the heat gain or loss (depending upon the direction of the gradient). At the same time, the greater the size of the animal the greater is its capacity to retain or store radiant energy. 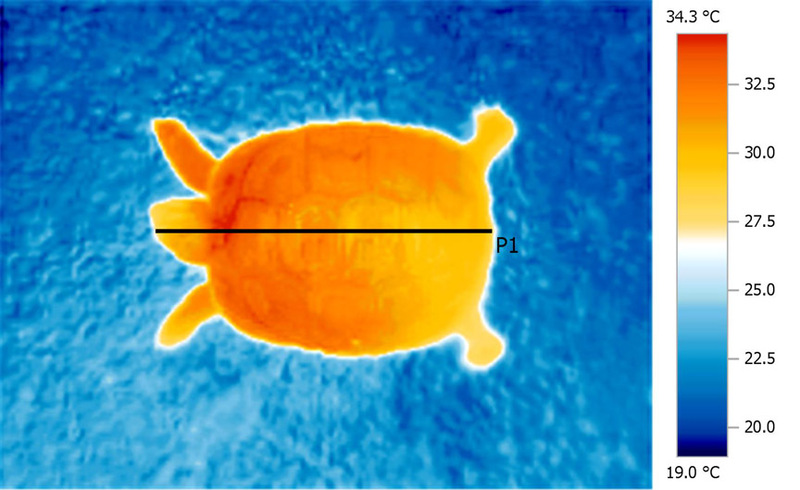 The ratio of surface area to volume is therefore an important factor when studying the thermal ecology of tortoises and turtles. Larger animals exhibit higher rates of resistance to temperature change than do smaller animals; this property is known as ‘thermal inertia’. Once a large tortoise or turtle has completed its basking cycle, it is able to rely upon retained heat for quite some time in order to allow it to carry out is desired functions. A smaller animal, by contrast, loses accumulated heat very much more rapidly, and has to resume basking sooner. Some very large species, such as Galapagos and Seychelles giant tortoises are able to maintain a very stable core temperature for extremely extended periods, despite being subject to substantial variation in external environmental temperatures throughout the day. Smaller animals are, however, more closely coupled or tied to their thermal environments, and they have often ‘learned’ to use this property in a variety of useful ways, notably through their greater exploitation of microclimate opportunities. Not only temperature, but also humidity and rates of fluid loss, can be moderated by careful use of burrows and scrapes, for example. Captive environments typically offer far few choices in terms of thermoregulation and self-management of fluid losses than is commonly found in nature. Captive animals may be exposed to very limited environmental choices and may remain directly in the immediate vicinity of artificial heat and light sources for extremely extended periods. It is therefore critical that such sources provide a safe and effective method of lighting and heating. 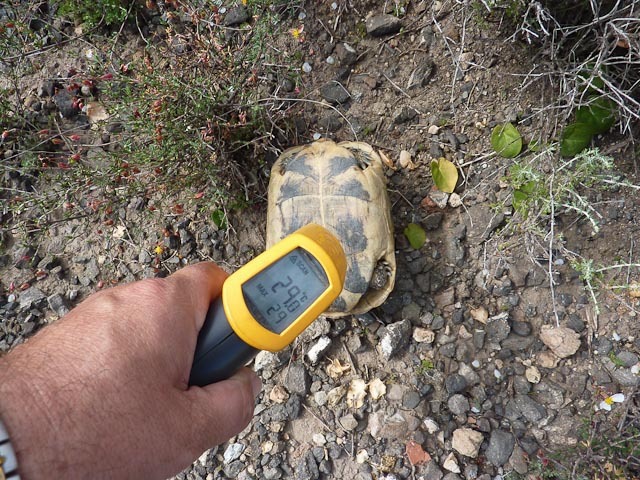 Over the course of several years, data was recorded from wild tortoises in their natural habitat in Southern Spain using a Fluke TiS (and later, Testo 875-2i) thermal imaging camera. Other measurements were recorded using a Fluke model 62 non-contact infra-red thermometer. Simultaneously, data on environmental temperatures and relative humidity was recorded using a series of SL-54TH and SL54TH-A miniature data loggers and Temp-IT Pro software. Other equipment used included the Fluke 971 Hygro-Thermometer, and the Fluke VT-04 hand-held non-contact infra-red thermometers. Adjustments were made to compensate for the emissivity of reptile skin and keratin. The same instruments were then used to collect data from captive animals. These animals were measured in the same indoor enclosure, under a series of typical basking lamp configurations. Lamps with power ratings from 60 watts to 250 watts were tested as these are the type of lamp most commonly employed in captive situations. Also tested were examples of infra-red dull emitters (‘ceramic heaters’) as these are also used frequently by reptile keepers. Mercury vapour, halogen, metal halide and regular incandescent lamps were employed in the trials. 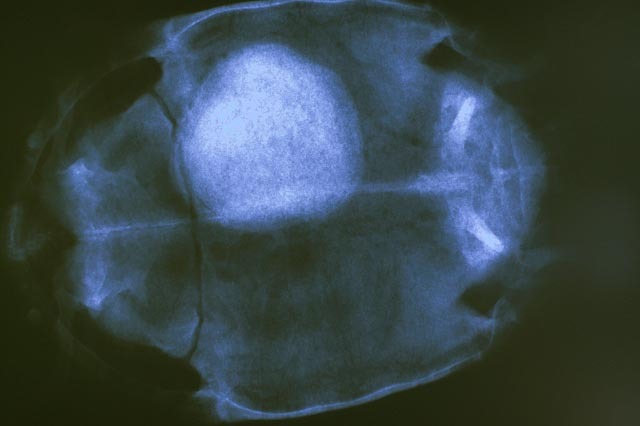 Tortoises were imaged at consistent, regular intervals during the tests: immediately after the lamp was turned on, and again at 20 minute intervals until the test ended. Simultaneously, data on ambient (background) temperatures were recorded via data-logger, and ambient humidity was recorded at several points, again using precision data-loggers. Humidity data was recorded directly under the lamp, and again at distances of 30 cm and 60 cm. This combination of data allowed a comprehensive picture of the heat distribution patterns and effects on ambient humidity within the basking zone to be established. Unfortunately, manufacturers and distributors of lamps and heaters intended for use with reptiles rarely provide sufficient data on the infrared emissions they generate. However, data for generic classes of lamps and heaters, such as tungsten filament, mercury vapour, metal halide, ceramic and halogen are available as such information is required in the course of health and safety assessments. Reptile keepers use these lamps in a very different way from that envisaged by their original designers, however, with such lamps routinely used in very close proximity to living subjects and with very extended periods of exposure in many cases – up to 14 hours a day, 365 days a year, with the hot surface of the lamp as little as 30-60cm away from the surface of the skin. The effects of this kind of intense exposure have, however, rarely been studied. c) The narrow beam emission of most lamps, of special relevance to larger reptiles. d) Sub-optimal UV-B to D3 conversion due to poor heat distribution over the entire body, where a small area is heated to dangerous levels, while the majority of the body surface remains too cool for effective D3 synthesis. b) Localised dehydration effects caused by close proximity to artificial heat sources. The two are closely linked. A range commercially available lamps commonly used by reptile keepers of various sizes and powers, including ordinary incandescent reflector lamps, self-ballasted mercury vapour lamps, and metal halide lamps were installed in a testing rig whereby the lamp height could be varied and the surrounding ambient temperature controlled. A series of measurements as described above were then taken to establish the temperatures achieved at various distances and the size of the resulting ‘basking zone’ created. In addition, simultaneous air humidity measurements were recorded. Tortoises and larger lizards also present a problem due to the fact that the highest part of their body will be significantly closer to the heat source than lower parts. The closer the lamp or heat source is, the more pronounced the 'uneven' heating pattern that results will be. 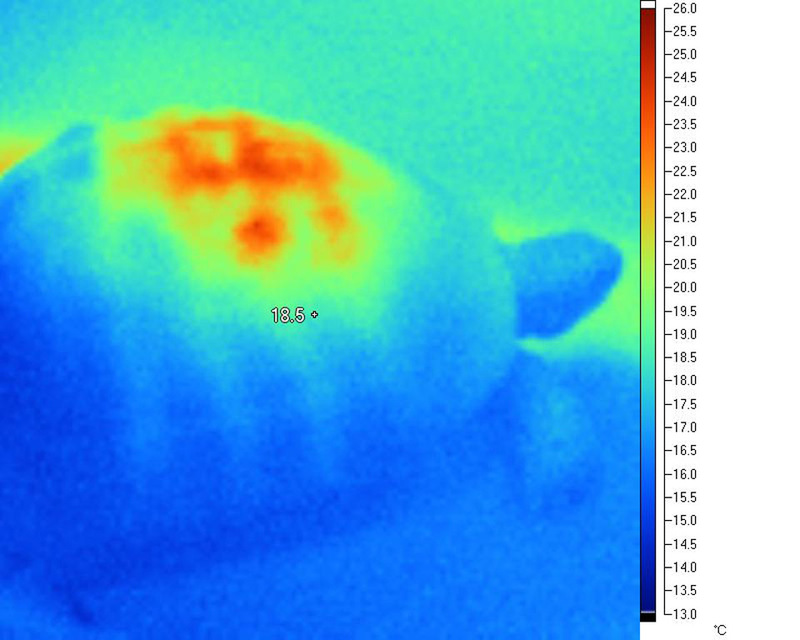 From the images below, it is clear that heat is highly concentrated in a relatively small area of the carapace directly beneath the lamp. This is a very typical situation with all basking lamps, and becomes more intense as a) the size of the tortoise increases and b) as the lamp distance reduces. The larger the animal and the smaller the (relative) size of basking source, the more exaggerated the effect becomes. Ideally, to limit this effect the basking source would generate an infinitely wide ‘beam’ and would have an extremely large radiating surface area. It would be capable of being used effectively at a great distance from the animal’s body. The sun, of course, is just such a source. Unfortunately, there are many technical problems in reproducing this with current technology using artificial lamps. One of the main difficulties is that as lamp size, power and effective distance increases so do electrical power requirements (wattage), and running costs - which rapidly become prohibitive. While a 120w lamp may be considered viable in terms of running costs, lamps of many hundreds of watts or even several kW in power are required to evenly heat large areas from safe distances. In practical terms, keepers should consider the use of higher output, large lamps (or banks of lamps) deployed in such a way that the 'spot heating' effect is minimised and distance from the lamp to the animal is maximised. At an absolute minimum, basking zones should at least equal the entire body size of the animal. This disproportionate and unbalanced heating effect is very different from the heating effects observed in the wild. It has serious implications for everything from natural D3 synthesis to digestive processes. The effect typically seen under lamps is highly localised heating (sometimes over-heating to the point of trauma) of a small portion of the animal, where under natural conditions the distribution is much more even. In short, the differentials are more extreme in tortoises under artificial basking sources than they are in nature, and in particular, very extreme differences are seen between the area closest to the lamp and, say, the plastron and the core temperature. 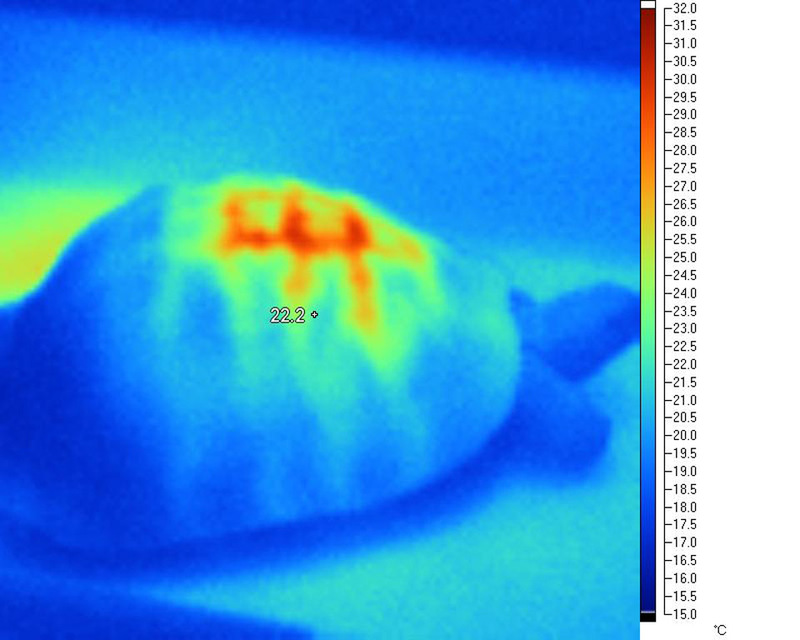 In addition, the first image also gives some insight into why thermal burns from lamps are especially common in very large tortoises (Leopard and African Spurred tortoises, for example, under heat lamps). In an effort to raise their core and extremity temperatures to desired levels, they effectively "cook" the surfaces closest to the lamp, attaining dangerously high levels in a small area, while continuing to remain far too cold elsewhere. Extended basking under these extreme hot spots may cause serious localised over-heating and tissue damage. This phenomena is unknown in wild free ranging reptiles, but is very common in captive animals maintained using heat lamps. It is probable that this occurs because the animal relies very much on attaining a suitable core temperature to regulate basking duration, and they become 'confused' by this highly concentrated beam effect, remaining under the lamps for far too long. It is also the case that if only a small part of the body is adequately heated, but the remainder is too cold, the animal may stay directly under the heat source for very extended periods in an attempt to achieve even heating and the desired body temperature. Tortoises with ‘burned’ scutes and larger lizards, such as Green iguanas with deep tissue burns are a frequent consequence of this behaviour. In addition to distance and behaviour, there is another factor which contributes to this problem. Artificial lamps as used for basking sources typically also emit significant amounts of energy in the spectrum that is readily absorbed by water molecules. The water molecules that they encounter first are those in the small (insignificant) distance of air-space between the animal and the lamp, and the next concentration of water molecules they encounter are those in the animal’s tissues. These begin to absorb that energy, and in so doing become heated. Other gasses in the atmosphere, including carbon dioxide and methane, also have infra-red absorption properties, but water vapour is by far the most significant. As water vapour absorbs this energy, the amount reaching the surface in the relative absorption bands is greatly reduced. Infra-red after having passed through water molecules is known as WirA (Water-filtered Infrared-A). One author describes these properties as “The experience of the pleasant heat of the sun in moderate climatic zones arises from the filtering of the heat radiation of the sun by water vapor in the atmosphere of the earth. The filter effect of water decreases those parts of infrared radiation (most parts of infrared-B and -C and the absorption bands of water within infrared-A), which would cause – by reacting with water molecules in the skin – only an undesired thermal load to the surface of the skin” (Hoffman, 2007). Conventional artificial IR sources have no water-filtering capability, and instead generate a broad spectrum of infrared-A, infrared-B and parts of infrared-C near to infrared-B. These sources include wavelengths with high absorption but poor penetration properties for living tissue, and consequently result in most of their energy being disproportionally 'dumped' on the upper layers of the skin, causing rapid surface heating but poor deep-tissue warming. WiRA has a number of very interesting properties that only in recent years have begun to be adequately investigated (1). For example, it is very effective at penetrating to deep-tissue levels, without imposing a high thermal load (heating effect) upon the skin. 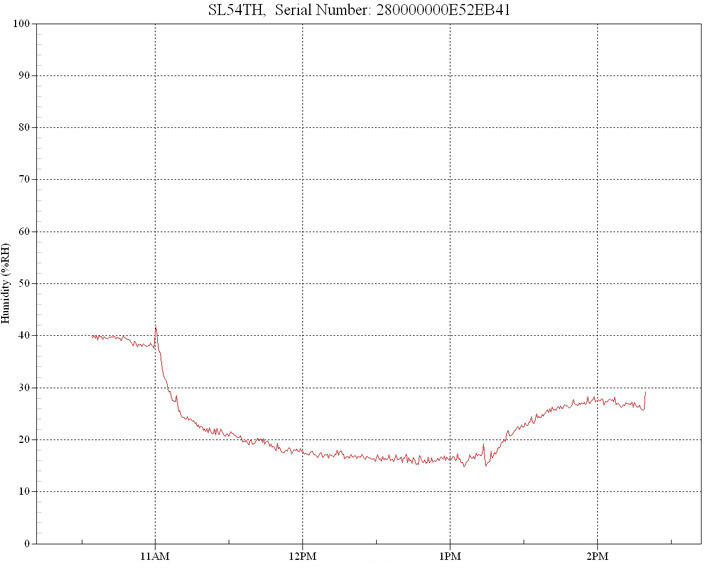 Significantly, this is the opposite of the effect generated by typical incandescent and gas-discharge basking lamps. In addition to the reduced thermal load (heating effect) upon the surface of the skin or other tissues, WirA has also been shown in multiple clinical studies to improve wound healing, to reduce secondary infections following wounds, and to reduce pain following injuries. So effective is it in these roles, that highly specialised water-filtered infrared medical lamps are now in routine use in hospitals and veterinary clinics. Unfortunately, the technology involved is extremely expensive to implement, and such lamps are not only very costly to purchase but also incur high maintenance and running costs (2), and as such these lamps are not viable for use by reptile keepers. In simple terms, a key difference between WiRa as found in natural sunlight and as produced by specialist medical lamps and ‘standard’ basking lamps is that WiRa penetrates deeper into the tissues promoting a ‘deep warming’ effect (further distributed by the circulatory system), whereas the energy from non-WiRa sources is mostly absorbed by the surface tissues, where it may cause localised overheating, while leaving other regions of the body too cool. The effects of basking in natural solar radiation are therefore quite different than that seen from basking under artificial heat sources when examined using infrared cameras. The precise effects of heating on and within the tissues of the skin are related to the different layers of which the skin is composed, and which does, of course, vary according to species. Each layer of skin tissue will have different light and energy absorbing and reflecting characteristics. The degree of reflection is also dependent on the melanin content; the darker the skin, the less the radiation will be reflected, especially in the visible region. In humans, the epidermis or outer part of the skin formed of two layers: the stratum corneum or horny layer, with a thickness of 8 - 20μm, and the stratum malphigi, with a typical thickness of 50 – 150μm. Below the epidermis is the dermis, which varies in thickness between 1 and 4 mm. All these layers have different refractive indices and different reflective, transmission and scattering characteristics, depending upon the wavelengths they receive. 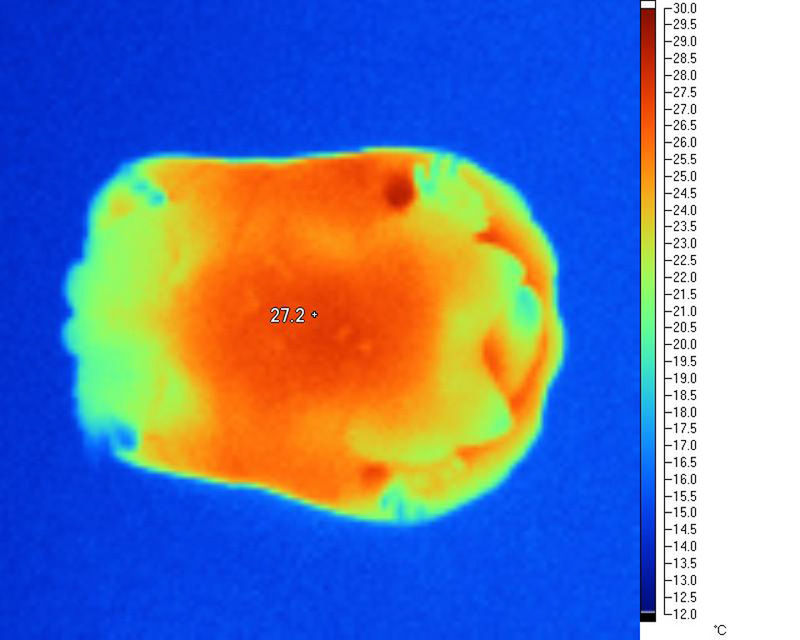 Infrared radiation in the IR-B (medium infrared: 1.4 - 3 μm) and IR-C (long infrared: 3μm - 1 mm) ranges is readily absorbed in the top layers of human skin. Because these layers are relatively thin, the result is a strong heating effect with a high temperature up to the pain threshold at approximately 45°C being attained rapidly when the skin is exposed to high levels of IR in these bands. Indeed, the pain response of humans is relied upon in Health and Safety regulations for workers exposed to IR where no specific limits are set for skin, as “it is assumed that the normal response to the discomfort or pain of the IR radiation will cause the person to remove their skin from exposure”. (Cherrie, Howe & Semple, 2010). However, it is not at all clear that this response can be relied upon in the case of reptiles. Shorter-wavelength IR-A radiation has a greater penetrating power, warming the sub-dermal tissues to a greater depth (several millimetres vs. 1 mm or less for IR-B), consequently lamps with high outputs in the non-water-filtered IR-A, IR-B and IR-C wavebands have a profound heating effect upon the surface tissues, but a poor heating effect upon the muscles and other tissues under the skin. 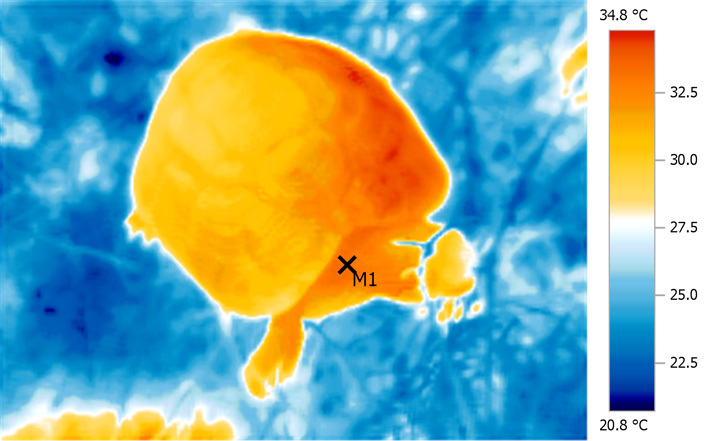 In the case of reptiles, this has important implications for thermoregulation and in particular questions arise as to how it impacts the way in which the reptile interprets the thermal 'signals' it is receiving, as these are so dissimilar to the signals received under natural basking conditions. Misinterpretation of these thermal signals may prove to be a viable explanation of why so many captive reptiles present with thermal trauma when maintained under artificial heat sources. This situation is summarised by one specialist reptile veterinarian as “Thermal burns in amphibians and especially reptiles are very common injuries seen by herp veterinarians. The exact reason why these animals seem so prone to burns is not understood, but, something about their behavior and their ability, or inability, to sense thermal injury makes them more susceptible to this type of trauma than any other captive animal” (Navarre,B, DVM, 2008). Under natural sunlight, the animal’s entire body heats up very evenly as the naturally water-filtered IR-A penetrates deep into blood-rich muscular tissues without causing over-heating of the skin surface, and consequently this heat reaches the core organs rapidly. This process is aided by the many varied behaviours reptiles use to gain (or lose) heat; body postures, degree of contact with the surrounding environment, and the use of sheltered areas (wind chill reduction) or use of shade and partial shade, etc. When seeking to maximise their temperatures, they may extend the neck and limbs fully, thereby exposing these blood-rich areas directly to sunlight and the penetrating heating effect of IR-A, and may isolate their bodies as much as possible from cooler ground surfaces. Very even, deep heating from natural WiRA is particularly evident when areas of high blood flow such as the base of the neck are studied. This area is also a good indicator of overall 'through and through' heat distribution and core temperatures. The use of such postures can greatly accelerate the equalisation of temperatures throughout the entire body. The ‘correct’ deployment of such behaviours, however, is dependent upon the animal receiving suitable and reliable cues from the environment and from the degree of heat that is sensed, and it is doubtful that many artificial environments provide this. 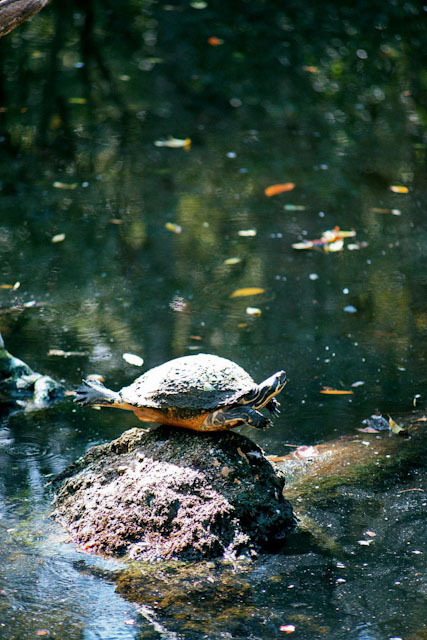 A basking turtle employs isolation from cooler surfaces, plus limb and neck extension to rapidly gain heat from solar radiation. The limbs and neck are rich in blood flow and rapidly 'circulate' heat to the core. They are also areas that are very important to Vitamin D3 synthesis. Considerable solar heat gains over ambient are possible with tortoises basking in their natural environment; in this sense, tortoises (and other basking reptiles) are highly effective 'solar collectors' able to acquire and store solar IR energy very efficiently. 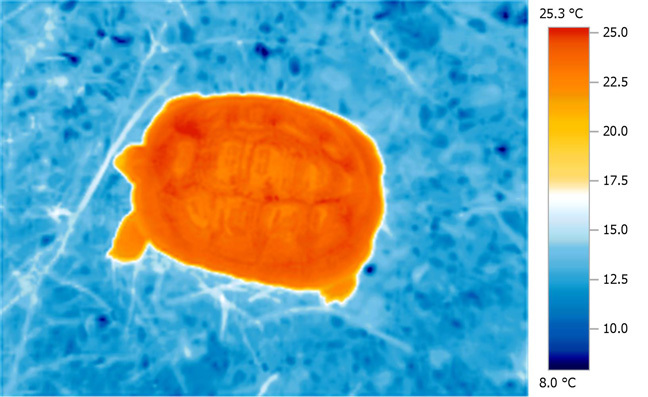 This is very evident when we examine thermal images of basking tortoises in the Mediterranean zone, where the amount of heat acquired is immediately obvious. Less obvious, but equally, if not more important, is the 'depth' and even nature of the thermal distribution throughout the entire body. This is highly characteristic of the deep tissue penetrating properties of atmospherically water-filtered infra-red. 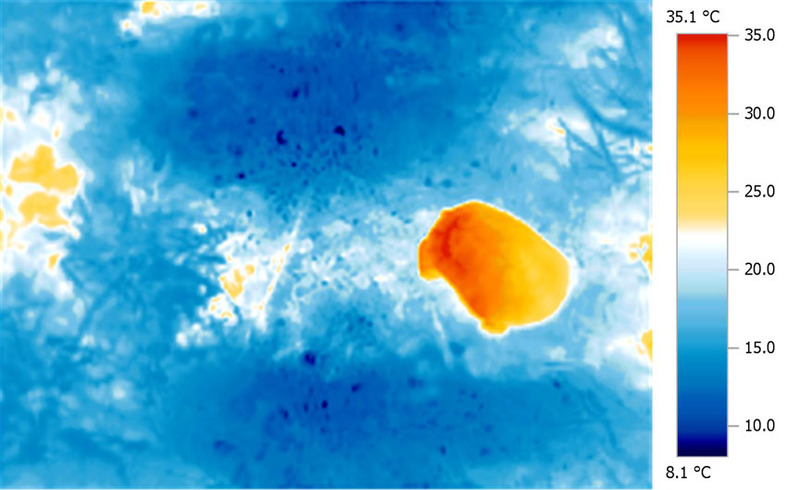 The very even nature of the heat distribution, even to the extremities, is evident when examining a thermal image. While it has been acknowledged (Baines, 2007) that eye-damage to reptiles may occur as a consequence of over-exposure to ultraviolet (UV) light at certain wavelengths (photo-kerato-conjunctivitis), little attention has been paid to infrared in this respect. However, it is certainly the case that in humans infrared wavelengths in the 3µm to 1mm range are absorbed by the front surface of the eye, and wavelengths in the 3µm to 1.4µm range penetrate quite deep into the eye where high levels of such exposure give rise to a condition known as “glass blower's cataracts”. High levels or extended periods of exposure to IR-A can also result in this condition . Whereas UV induced eye damage tends to be of short duration, is restricted to the cornea and the eyelids, and is normally reversible, IR induced eye damage is far more serious, affects the inner mechanisms of the eye, and is not normally reversible. Furthermore, intense drying of the optical surfaces can also result in eye irritation and in more serious conditions. Unfortunately no reliable data currently appears to exist on the incidence of IR-related optical conditions in captive reptiles. Different species have very different needs in terms of environmental humidity. Broadly speaking, these requirements closely correlate to the type of habitat they occupy.As a general guide, tropical forest species may require an average RH of 80% or more, while a typical arid or semi-arid habitat species will require the ambient RH to be in the 45-55% average range. The typical minimum RH recorded for Testudo graeca graeca in Southern Spain, for example is in the 25% range, but animals rarely spend extended periods exposed to such low levels, instead seeking retreat in scrapes or under vegetation where levels are greater (typically 40-50%), and fluid losses lower. Suitable microclimate provision will help to limit fluid loss from evaporation (which occurs via the skin and also as a result of respiration), and will also help to stabilise sudden body temperature fluctuations. 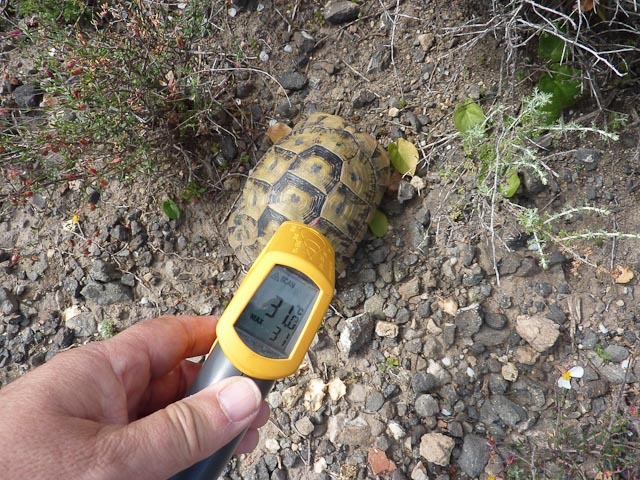 Microclimates are, therefore, very important to tortoises and they are utilised extensively in the wild by many species, and are of particular importance to species that inhabit inhospitable arid environments. While excessively dry environments should be avoided, so too should excessively moist or damp environments. The correct environment should be dictated by the natural habitat. Subjecting arid habitat species to consistently excessive levels of humidity for extended periods can result in shell infections, skin diseases of both bacterial or fungal origins (high humidity softens the keratin in reptile skin), and can increase the probability of respiratory disease in some species. Periodic and shorter term exposure to high humidity levels is generally not harmful, however, provided opportunities for drying afterwards are available. This occurs routinely in nature, when increased humidity levels and precipitation occur even in very arid environments on a seasonal basis, and where dampness may be experienced in the early hours of the morning as the dew point is reached. Sustained relative humidity levels below 20% for extended periods are also not appropriate even for desert reptiles, and can result in chronic dehydration with serious consequences for health and welfare. Associated health problems include an increased incidence of renal disease and gout-related disorders, an increase in bladder ‘stones’ formed from concentrated uric acid crystals, and general debilitation. An adequate hydration status and appropriate ambient level of relative humidity is absolutely essential if health is to be maintained. Unfortunately, in our tests, which were conducted over a five year period, and that involved taking measurements from more than 30 different lamps of various brands, models and powers, each of which is in regular use worldwide as a basking lamp by reptile keepers, every one without exception produced dangerously low humidity levels in the area directly under the lamp when used at the distances required to also provide adequate basking temperatures. 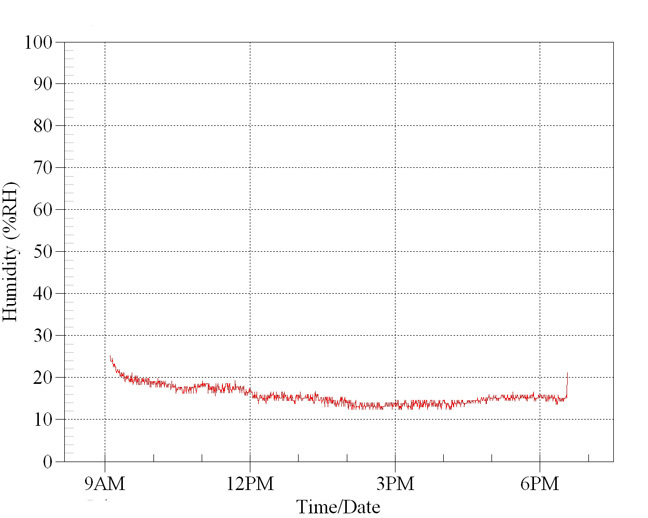 These graphs illustrate the dramatic reduction in ambient humidity experienced directly beneath typical reptile basking lamps. In all cases humidity is reduced very rapidly after the lamp is turned on. Typical room ambient humidity levels were employed as a starting position. The general room ambient relative humidity was also monitored simultaneously at a distance of 2M using an independent data logger. 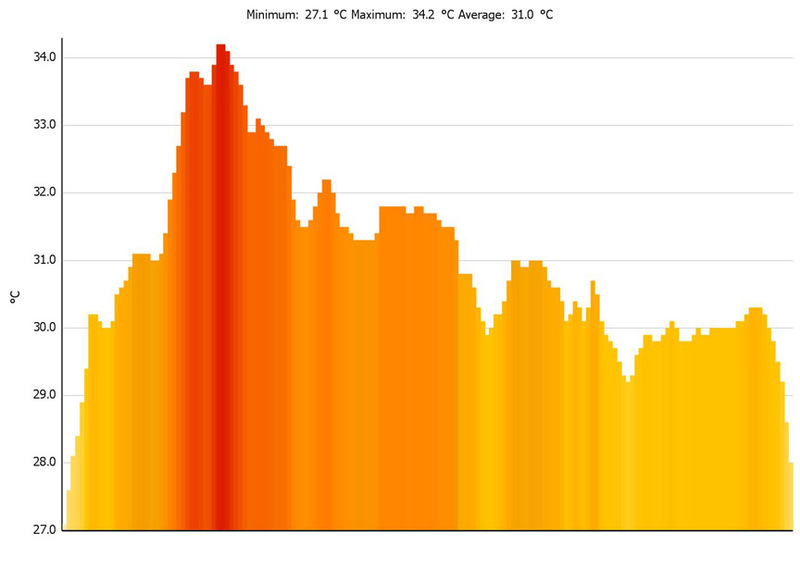 In this first graph ambient room humidity level was 70%. Within seconds, directly under the basking lamp the levels fell to 30%, then to below 20%. The lamp was switched off and levels recovered. It was then turned on again and levels fell as before. Multiple tests confirm these results. Relative humidity measured over 12 hours under a 100w basking lamp. Room background humidity was 70%. In this example, a 100w basking lamp was situated at 30cm from the target with an initial ambient humidity of 40%. Any source of infrared that generates emissions in the 2.5µm to 3.5µm band will exhibit a profound dehydrating and drying effect because this is the band where water has its peak absorption spectrum, centered around the 3µm wavelength. Significantly, this 3µm band is also where keratin, the dominant component of reptile skin, also has strong infrared absorption (3). So effective is IR in the 3µm wavelength at heating and drying water that it is now employed in rapid-drying technology, particularly in the printing industry (4). Long-term graph showing effect of an overhead heat lamp within an enclosed terrarium. 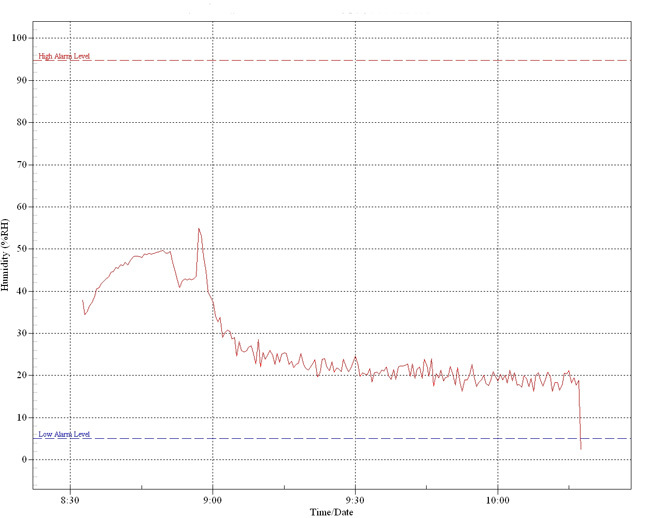 The peak just before 9.00 is due to moisture within the substrate becoming vapourised by the heat generated. Thereafter, levels fall dramatically to below 20%. This combination of excess thermal loading occurring on the surface tissues, and the high activity of IR in this wavelength upon water molecules, is why this dehydration effect is so severe upon living animals exposed to it at high levels or for extended periods. Nine hatchling Testudo graeca graeca of exactly the same age, size and weight (in fact, they were siblings from the same clutch of eggs) were separated into two groups. The first group received no exposure to basking lamps and heat was provided entirely by exposure to natural sunlight. The second group was shielded from sunlight, and basking facilities provided only by an overhead 100W mercury vapour lamp. Temperatures were maintained, as closely as possible, to remain similar between the two groups. 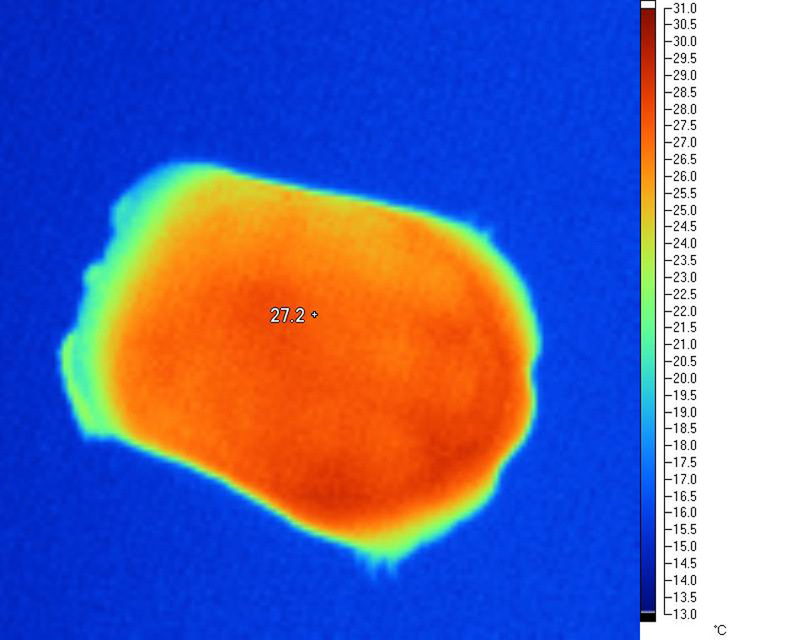 This was checked by means of an infra-red 'spot' reading thermometer, by continuous monitoring with a pair of data-loggers, and by use of an infra-red thermography camera. Both housing units were situated next to each other in the same location to ensure near-identical rates of air movement and general ambient humidity. Both groups were housed in identical open-topped 70 X 50 X 20 cm plastic containers with 5 cm of natural earth substrate to enable equivalent burrowing opportunities. In an effort to approximate identical periods of exposure to basking temperatures the period the lamp was turned on was controlled by a photo-electric switch that operated in synchronisation with periods of sunlight. As a result, overall exposure to a high temperature basking zone was similar between the two groups. The diet was identical in both cases. A shallow water dish was provided and refreshed daily. After four weeks, it was noted that the expelled urates of the group provided with the heat lamp were visibly much more concentrated and 'gritty' than the group where only natural sunlight was employed. By contrast, no urates of 'gritty' appearance were generated by the group maintained under sunlight at any time during the period of the trial. The trial was terminated at six weeks due to concerns that the group under the heat lamp were becoming dangerously dehydrated. Weight loss in this latter group was also noted. While hydration status in this instance was not confirmed via biochemical means such as PCV or serum urea levels, in the author's experience, visual examination of the urate output remains a solid indicator. The group that had been maintained under the basking lamp were then transferred to the same regime as the other group, and within 21 days the concentrated, 'gritty' urate output ceased and their weight also recovered. In order to compare the response of fluid-rich but non-animal objects exposed to basking lamps, two fresh mushrooms of similar size and weight were selected. 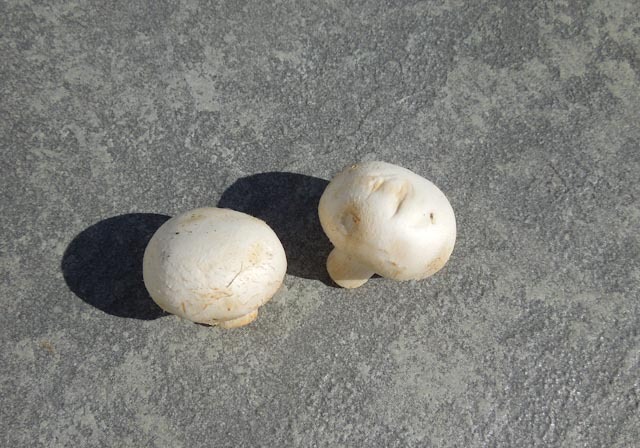 One mushroom was exposed to natural sunlight for 8 hours on a roof terrace in Southern Spain. The second was placed in the same area, but was shielded from the sun, and instead exposed to a 100w basking lamp. The height of this was adjusted regularly so that the surface temperatures of the two mushrooms matched closely. The airflow and ambient humidity was absolutely identical throughout the test. Neither mushroom's surface temperature exceeded 20C. This is the result after 8 hours. The mushroom on the left is the one from under the lamp. The mushroom on the right lost 17% of its starting mass. The mushroom on the left lost 44%. These results should not be dismissed as irrelevant to reptile keepers. They demonstrate very real effects that have been reported in several other studies of the effects on IR radiation upon fruits and vegetables, and the causal mechanism is identical to that which produces similar results in live animals. The mushrooms after the trial. The one of the left was under an artificial lamp, the one of the right under natural IR from the sun. It is worth repeating that this manufacturer's description is of a product widely sold to reptile keepers under various different brand names. Bladder calculi ('stones') are particularly common in captive tortoises. They are also frequently encountered in Green iguanas. Some veterinarians have estimated that 10% of their tortoise patients turn out to have bladder calculi present (Mader, undated). Other veterinarians have stated that “Cystotomy to remove a bladder stone is the most common surgery of chelonians in our practice” (Wright, 2008). 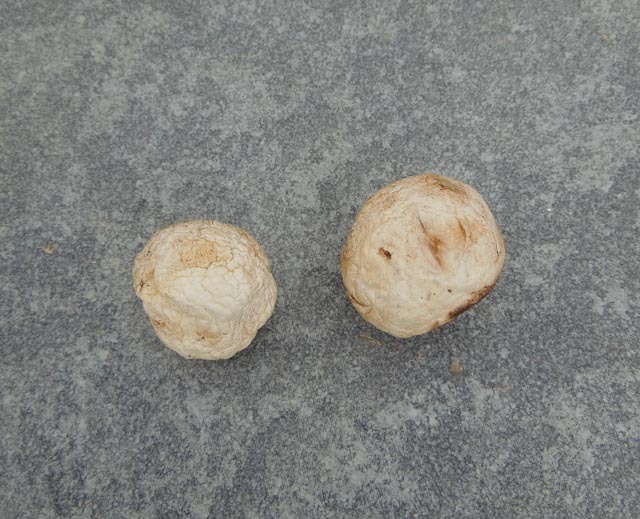 While some examples of bladder stones in wild tortoises have been recorded, they are far more common in captive animals. Several factors are implicated, including diets that produce high blood urea levels (for example, diets excessively high in proteins), but the key factor most frequently identified in such cases is the hydration status of the animal. Captive reptiles are at high risk of dehydration for a number of reasons. The present author pointed out many years ago that lack of adequate microclimate provision was one such factor (Highfield, 1995). It is now clear from the above data that the IR spectra emitted by common basking heat sources is far more drying and dehydrating to living tissues than has previously been recognised, and it is proposed that this plays a hitherto unsuspected major role in the incidence of this condition. Misting and spraying: This will offer temporary relief from over-dry conditions, but its effect is extremely short-lived once basking heat sources are switched on as evaporation will begin to occur almost immediately. We conducted a number of tests, and found that after only 20 minutes surfaces near to basking lamps were as dry as they were before spraying took place. There may be benefits at least in terms of keratin hydration (for example, tortoise scutes) if a spray is given at night, after such lamps are turned off, however. It remains the case, despite this, that once the animal moves directly under a basking source emitting IR wavelengths in the absorption spectra of water, very rapid drying will still occur. Drinking and soaking: This is certainly effective at reducing the risk of overall dehydration, provided it is carried out frequently enough. It will not necessarily prevent localised surface tissue dehydration, however, or localised responses to that state, for example skin (or keratin) thickening. Many keepers only offer fluids two or three times a week, and this would appear to be completely inadequate. Fresh water in a suitable vessel should be available at all times in captive situations, even for arid habitat species. Small tortoises or lizards, however, may still dehydrate very rapidly indeed when exposed to basking lamps with problematic IR emissions. 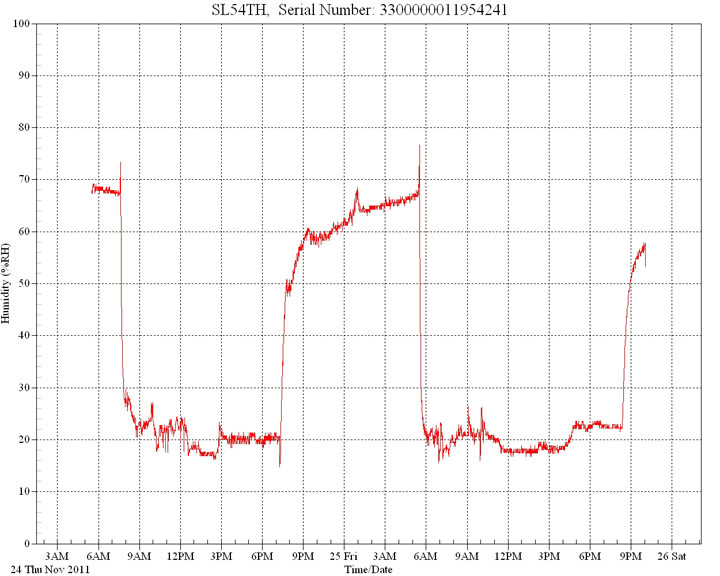 Urate outputs should be monitored carefully. Ambient humidity provision: All reptiles need to be provided with suitable levels of humidity, according to species. These requirements vary considerably. Maintaining even moderate levels of humidity in the vicinity of basking lamps and IR heat sources is, however, very challenging . Many keepers fail to use accurate measurement techniques, or rely upon low-cost wildly inaccurate hygrometers and as a result, may believe that the humidity provision is adequate when in fact it is dangerously low. Basking lamps are, unfortunately, very good at overwhelming keeper's attempts top ensure adequate levels, which must be recorded immediately adjacent to the animal, using reliable instruments. Even very high humidity levels, however, do not affect the absorption of IR energy by the surface of the skin, and the amount of water vapour in the air in a terrarium has no 'water filtering' effect due to the short distance involved (atmospheric IR water-filtering requires transit through substantial distances of the troposphere, which is between 17 to 20km deep). Suitable microclimates: The provision of correct microclimates will help to reduce overall fluid losses (which occur via both cutaneous and respiratory avenues), and will also assist with behavioural thermoregulation. Rapid drying and dehydration can still occur, however, during periods outside of the microclimate. In the case of exposure to basking lamps with high IR outputs around the 3µm wavelength this will occur very rapidly. While individually none of the above measures will entirely counter the effects of excessive drying, a combination of such measures, tailored to meet the requirements of a particular species, will certainly help to alleviate the worst effects, at least in the short term. Different lamps and heaters produce differing wavelengths and intensities of IR radiation. Reptile keepers frequently use such lamps in situations where the subject is exposed to them for extended periods at short distances. The effects of this have been inadequately studied and are rarely considered. These results suggest that much more attention needs to be given to this subject and that keepers should be very cautious when using any artificial source of heat. Alternatives such as outdoor greenhouses and other structures that rely on natural solar radiation to provide basking heat should be considered. While some such structures will block UV-B, this can be provided by mean of fluorescent fixtures that emit negligible IR. Keeping reptiles in colder climates is very challenging and some recourse to artificial sources may be unavoidable. These results suggest this should be minimised as much as possible, however. Where artificial sources are used, they should be used at safe distances, should provide the broadest possible basking zone that at least is capable of covering the entire animal evenly (this necessitates the use of larger lamps, or arrays or lamps, at greater distances with larger reptiles), and should be selected to minimise output close to the IR absorption band of water molecules. In this respect, Metal Halide lamps are to be preferred over tungsten-filament and mercury-vapour sources. Ideally, IR sources should be water-filtered, but this technology is presently prohibitively expensive and such lamps use large amounts of energy to produce even modest heating performance. This author concurs with the opinion expressed by wildlife biologist Dr. Paula Kahn who, in an article published on the website of the San Diego Zoo states, speaking of heat and UV light : “There is no lightbulb on the face of the earth that can provide the exact amount of heat and light that a tortoise needs”. The more we probe into the effects of our attempts to keep animals under entirely artificial conditions, the more deficiencies we discover. Nowhere is this truer than when we consider the effects of artificial sources on live animals that have evolved for millennia under natural sunlight. We recommend minimising the use of artificial lamps for heating purposes as much as possible. Where they must be used, employ large basking zones that provide suitable basking temperatures over an area at least as large as the entire body of the animal and avoid using lamps in close proximity to living tissue. Larger, more powerful lamps at a greater distance are preferable to under-powered lamps used at close quarters. Larger animals with greater peak body height from the floor are are much greater risk of uneven heat distribution and local over-heating at the point closest to a lamp than are smaller, 'flatter' animals. Tortoises and large lizards are particularly problematic and require extra care. Check body temperatures carefully in several places, with special attention to the areas closest to any lamp. A non-contact infra-red thermometer is invaluable for this. Subjectively, tortoises that have been basking under natural, atmospherically water-filtered infra-red typically feel “warm thorough and through”, as if holding a warm rock. By comparison, a tortoise that has been basking under artificial lamps may present a “hot top, cold base” effect. This is not a particularly scientific description, but it does convey the difference very clearly. 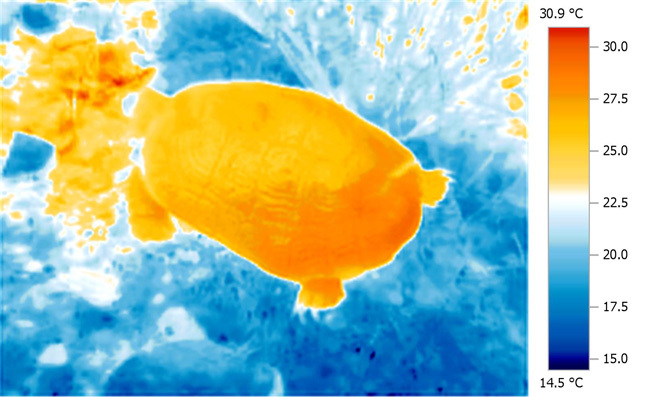 It is frequently assumed that the warm underside is the result of indirect heating from a warm substrate, but our thermal imaging studies confirm beyond reasonable doubt that it is primarily caused by the excellent deep tissue penetration and thermal diffusion resulting from atmospherically water-filtered IR-A. Uneven heating effects may be reduced in some situations by reducing the differential between the lowest ambient temperature and the desired basking temperature. However, it is important that a suitable gradient continues to be available. A hot basking lamp in an otherwise very cold enclosure will produce a more extreme 'hot spot' effect than the same lamp used in a moderately warm enclosure. Keepers should consider increased use of “sun room” type enclosures, agricultural tunnels, cloches and greenhouses. These typically provide far superior infra red performance over standard basking lamps and are capable of achieving excellent environments for thermoregulation. While UVB may be blocked in some units, it is relatively easy to provide for this by means of UVB-emitting fluorescent lamps. These do not cause heating abnormalities and have no significant effect upon hydration or humidity levels as they emit very little infrared. Sun-room type enclosures have added benefits in that they have very low running costs, use very little energy, and it is usually possible to provide larger areas for use by the animals. Even in winter, provided there is direct sunlight, impressive body temperatures can be achieved in many areas. PART TWO of this study is now available. Cherrie, J., Howe, R, and Semple, S. (2010) Monitoring for Health Hazards at Work. Wiley-Blackwell, 4th Edition. Highfield, A. C. (1995) Understanding Microclimates in Captivity. Highfield, A. C. (2010) The causes of “Pyramiding” deformity in tortoises: a summary of a lecture given to the Sociedad Herpetologica Velenciana Congreso Tortugas on October 30 2010. Kathiravan Krishnamurthy, Harpreet Kaur Khurana, Jun Soojin, Joseph Irudayaraj, Ali Demirci (2008) Infrared heating in food processing: An overview in Comprehensive Reviews in Food Science and Food Safety. Blackwell. Sakai, N., & Hanzawa, T. (1994). Applications and advances in far-infrared heating in Japan. Trends in Food Science & Technology, 5(11), 357e362. 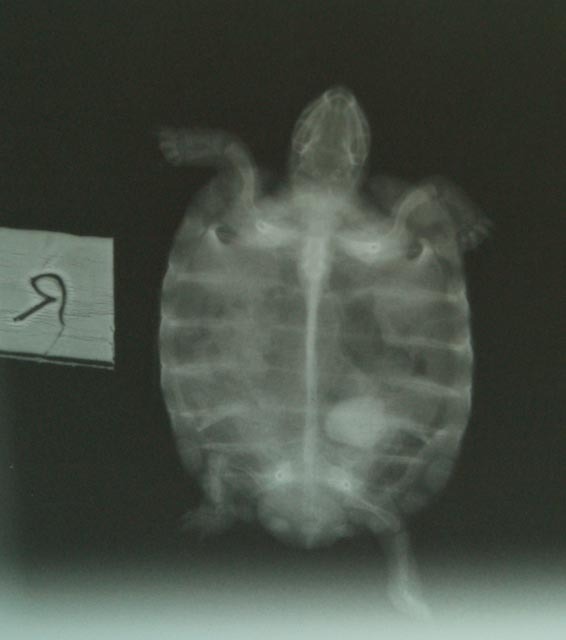 Wright, K. (2008) Clinical Management of Bladder Stones in Tortoises. Proceedings NAVC Conference, pp. 1804-1806. All text and images copyright (c) A. C. Highfield and The Tortoise Trust 2015.